Not far from Christchurch (NZ South Island’s largest city) lies Banks Peninsula, an atmospheric piece of land that juts out into the Pacific Ocean and faces the Antarctic continent. The peninsula is of volcanic origin and is about 1,150 square kilometers in area. Due to its proximity to Christchurch, it is today a well-known daytrip destination for travelers – both locals and foreigners alike. The peninsula is home to a French-inspired colonial town called Akaroa which sits at the heart of the tourist scene in the area. 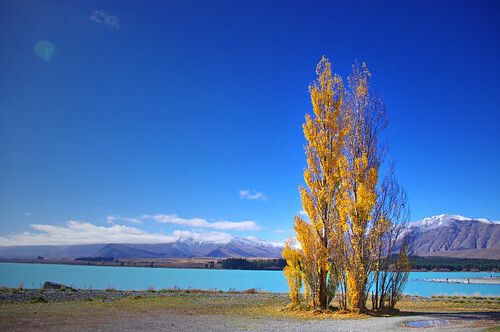 New Zealand is widely known as the filming site for many a Lord of the Rings films. The films were very popular, which meant that the spectacular scenery of the country was watched by millions. Looking back, the films probably did more for New Zealand’s tourism industry than any other marketing campaign and it was a great tie up between their tourism ministry and Peter Jackson (the director of LotR) who incidentally is a Kiwi. From Queenstown, we hired a 4WD vehicle and took a morning drive to Glenorchy on the northern edge of Lake Wakatipu. Some of the LOtR filming sites are situated within the vicinity. It was another great day as the clouds cleared up and the sky was as blue as can be. The drive took just less than an hour and covered a distance of 45 kilometers as we traversed past stunning mountains in the horizon. We spent a total of four nights in Queenstown and used it as a base to explore the many daytripping opportunities around Otago and the many national parks which are all within a few hours drive from town. On our first day, we joined a day tour to Milford Sound in Fiordland National Park (a UNESCO World Heritage Site). This tour took us past several quaint villages across the southern part of the island, and into the western coast which has a much wetter climate. Again, we went with Great Sights. The bus picked us up from the hotel at 8AM sharp for the five hour drive. It was a very scenic drive as that morning was my first opportunity to see Lake Wakatipu in the day. We drove past the majestic Remarkables mountain range, into the town of Kingston. Our driver was especially enthusiastic and gave erudite commentaries on the notable landmarks during the trip. We passed by this extremely quaint town called Garston, with a population of only 106. Its known as the most inland town in New Zealand which does not really say much given that NZ is an island nation. What really caught my attention was the small number of people who live there – 106. I suppose it’s one of those towns where everyone knows each other. Having lived in big cities my entire life (Manila, San Francisco, Singapore), I entertained for a few seconds the possibility of spending a night or two in a town where it’s impossible to remain anonymous. But it disappeared not long after we left the town limits and passed by another (larger) town. An old story goes that Queenstown got its name after a local gold digger proclaimed the town to be fit for then Queen Victoria of Great Britain. No queens roam the town currently but it is host to possibly a million or more visitors a year. While there are doubts to the story’s veracity, for sure only a few among that million would disagree with its message. People from all over include this small lakeside community as part of most trips to NZ, making Queenstown the most heavily-visited destination in the South Island. The town is a tiny urban center of merely 10,000 people but it feels like a much bigger place, owing largely to its popularity as a resort town. It has a compact but relatively dense downtown, a fabulous lake (Wakatipu), majestic peaks across all corners as well as extremely picturesque sites within a few minutes drive. Memories of NZ Pt1: Scenic Turns Everywhere! New Zealand. One of the most highly rated destinations in the world, said to be the world’s “youngest country” and adrenaline capital. It is probably one of the few countries in the world that I haven’t heard anything negative about. Everyone I’ve met who’s been there only have praises for this small but progressive nation. Despite a seemingly endless list of good things, New Zealand was originally not in my priority of travel destinations. I’ve heard good reviews about the country. And yes, I may have seen a few shows on TV attesting to the majestic landscapes in the land further down under. But that was about it. In my mind, there wasn’t any mystique about this country. There wasn’t one major attraction that I associated with New Zealand so the strong desire to visit just was not there.